(BLOOMINGTON, IN) -- A prehistoric water-filled cave in the Dominican Republic has become a "treasure trove" with the announcement by Indiana University archaeologists of the discovery of stone tools, a small primate skull in remarkable condition, and the claws, jawbone and other bones of several species of sloths. The discoveries extend by thousands of years the scope of investigations led Charles Beeker, director of Academic Diving and Underwater Science Programs at IU Bloomington's School of Health, Physical Education and Recreation, and his interdisciplinary team of collaborators. The researchers' focus has been on the era a mere 500 years ago when the Old World and New World first met after Christopher Columbus stepped ashore in the Caribbean, and on scintillating pirate lore. This rare find is expected to give insights into the earliest inhabitants of the Greater Antilles and the animals they encountered. "To be honest, I couldn't believe my eyes as I viewed each of these astonishing discoveries underwater," Beeker said. "The virtually intact extinct faunal skeletons really amazed me, but what may prove to be a fire pit from the first human occupation of the island just seems too good to be true. But now that the lithics (stone tools) are authenticated, I can't wait to direct another underwater expedition into what may prove to become one of the most important prehistoric sites in all the Caribbean." Beeker and researchers Jessica Keller and Harley McDonald found the tools and bones in fresh water 28- to 34-feet deep in a cave called Padre Nuestro. 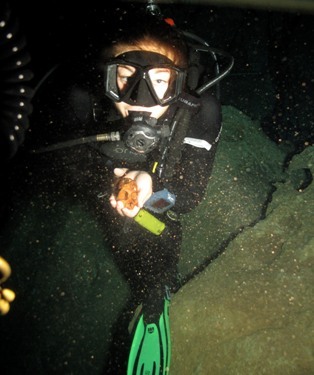 Nearby, and also underwater in the same cave, were found more recent Taino artifacts. The Taino were the first Native American peoples to encounter Europeans. Beeker and his colleagues have been diving in this particular cave, which sits beneath a limestone bluff and is only accessible after submerging into a small pool, since 1996 as they studied its use as a Taino water-gathering site. 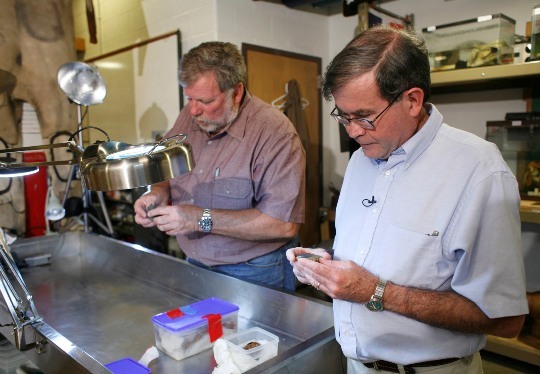 Charles Beeker, left, and Geoffrey Conrad examine some of the bones and lithics, which have been transported to Beeker's underwater science lab for further study. Geoffrey Conrad, director of the Mathers Museum of World Culture at IU Bloomington and professor of anthropology, said the tools are estimated to be 4,000 to 6,500 years old. 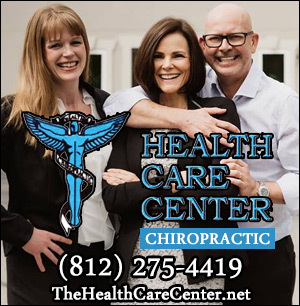 The bones might range in age from 4,000 and 10,000 years old. While sloth bones are not uncommon, he knows of only a handful of other primate skulls found in the Caribbean. 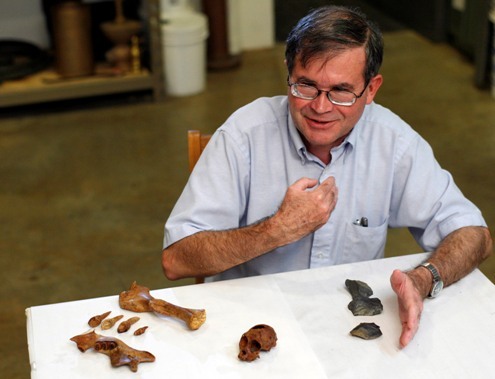 "I know of no place that has sloths, primates and humanly made stone tools together in a nice, tight association around the same time," said Conrad, also associate vice provost for research at IU Bloomington. "Right now it looks like a potential treasure trove of data to help us sort out the relationship in time between humans and extinct animals in the Greater Antilles. This site definitely is worthy of a large-scale investigation." The three stone tools and remnants, made of basalt and limestone, were examined by internationally known IU anthropologists Nicholas Toth and Kathy Schick, who told researchers the palm-sized stones showed unmistakable signs of human craftsmanship. Toth and Schick are co-directors of the Center for Research into the Anthropological Foundations of Technology (CRAFT) Stone Age Institute in Bloomington. IU Anthropologist Geoffrey Conrad discusses stone tools, a rare primate skull and a portion of the sloth bones found in a water-filled Dominican Republic cave by researchers from the Office of Underwater Science in IU's School of Health, Physical Education and Recreation. Jessica Keller holds the primate skull found in the Padre Nuestro Cavern.